What makes happiness? Is it a child's smile or an overwhelming sense of accomplishment? Nope. Not even close. Happiness is made by a V8 engine with a supercharger which, coincidentally, this jaw dropping Jaguar XKR has - and then some. Yours for price of a moderately equipped Honda Civic EX-L. The first car that was developed after legendary car designer Ian Callum took control of Jaguar's styling direction was the Jaguar XK. 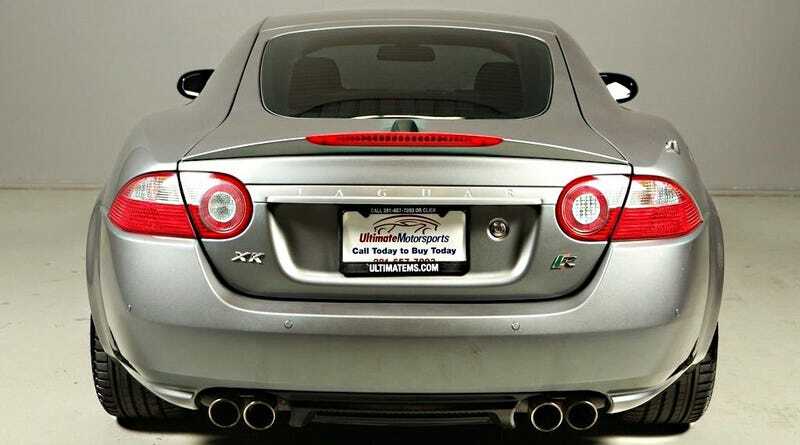 This XKR is the version that adds an intercooled supercharger to the already stout AJ engine, producing a frame-bending 420 horsepower and 410 ft-lbs of torque. A slouch it was not. This car also followed the basic design cues of Aston Martin's lineup, which isn't a bad thing in the least. It's like not knowing what design to make on your Easter egg, so you made one nearly identical to a Fabergé. It's certainly a timeless design and a looker from any angle, including the gratuitous use of polished burlwood, leather, and aluminum in the well-appointed interior. This Jag looks to be immaculate, with what looks like much higher than average ratings for its vehicle history reports. These Jaguars weren't particularly hard to work on, and their parts prices are still quite reasonable when compared to other high-end makes. It's faster than a comparable Aston, while being more usable and reliable day-to-day, and twice as cheap. A serious deal for a serious car connoisseur . Why Buy A Chevy Malibu When You Can Get A Supercharged Jag For Less?